Ever thought about looking for life on distant planets? Is there life outside of our Solar System? Will we ever find it? How can we find it? Three frequently asked questions when it comes to life on distant planets. One way possible way to find life outside our Solar System is to peer into the atmospheres of distant planets, looking for gases that may be produced by living organisms. A group of scientists think we should be looking for two gases in particular: carbon dioxide and methane. Most astronomers advocate looking for oxygen as a sign of extraterrestrial life. Oxygen is abundant in Earth’s atmosphere because there are many plants and other organisms that constantly pump out the gas. In a new study published in Science Advances, scientists suggest oxygen may not be the best target since the gas didn’t always exist in large quantities here on Earth – even when life was present. Billions of years ago, the Earth’s atmosphere had different combinations of gases, including carbon dioxide and methane, that only existed together because of the rudimentary life on Earth’s surface. Carbon dioxide and methane react with one other, causing the methane to eventually disappear, unless there are some types of organisms that keep pumping more methane into the atmosphere, according to the study. Finding those two gases together on another planet isn’t necessarily a clincher, though. Methane can be produced by a variety of processes, not just by living organisms. However, the study authors said they calculated the possibilities of an atmosphere having the two gases with no life on the surface, and the chances are pretty slim. “You can make a little bit of methane without life,” study author Joshua Krissansen-Totton, an exoplanet expert at the University of Washington, told The Verge. For a long time astronomers have debated what the best ways are to search for life in far-off worlds. Some have suggested studying the light reflected off a planet to see if there are features on the surface that look like vegetation. Others have argued that we should look for how gases change in a planet’s atmosphere. Earth’s carbon dioxide goes up and down throughout the year when plants in the Northern hemisphere die off in the fall and then grow again in the spring. Looking for oxygen has always been the biggest target, though. But even oxygen has its problems: some models show that lots of oxygen can wind up in an atmosphere without the presence of life. That’s why lately astronomers have suggested looking for both oxygen and other gases that ‘don’t belong’ together. These are gases that would chemically react with oxygen and make the gas go away. So they’re a strong indicator that something – like, say, plants – is keeping the oxygen around. Our planet is a great example of how this works: oxygen shouldn’t survive with all the methane in our atmosphere, and neither should it coexist with nitrogen and our large liquid oceans. However trees, plants, and even plankton in the ocean keep replenishing oxygen in our atmosphere, and without it, we wouldn’t be around. Krissansen-Totton and his team wanted to know if oxygen had always been the best sign of life on our planet. “If you’re an alien looking for life on Earth, it’d be really obvious now, because there’s all this oxygen,” he said. The answer: maybe not. For the first half of the planet’s history, there was virtually no oxygen in the air. And for most of the second half, the levels of the gas were really low. That’s because it took about a billion years for life to start producing oxygen after the first living organisms emerged, and it took many millions of years after that for Earth to have an oxygen-rich atmosphere. 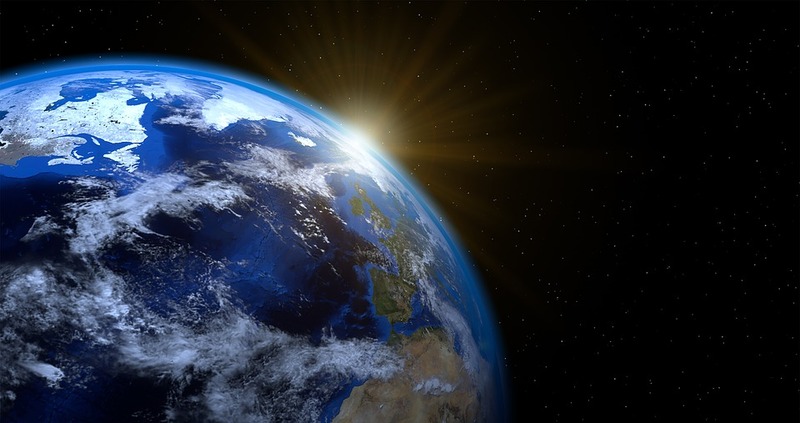 The researchers put together all of their best estimates of what has been in Earth’s atmosphere since the planet first formed 4.5 billion years ago. They found that in the first half of the Earth’s life, our planet still had four incompatible gases: carbon dioxide, methane, nitrogen, and water. So they propose looking for carbon dioxide and methane on other planets; the two gases are easier to detect than the others. “But if you find all four that’s great,” said Krissansen-Totton. Sara Seager, planetary scientist at MIT who was not involved in this study, said the approach could work. “It’s great to see the… debate continue with new ideas,” she said. But it’s always possible that further on, scientists may come up with other scenarios to explain a pairing of carbon dioxide and methane, Seager told The Verge. “This is normal and healthy in science, but in some cases, issues are not resolved for a long time or ever,” she said. Even if astronomers found these gases on another world, the planet would still need to be small and rocky like Earth, as well as the right distance away from its star so that liquid water could exist. But we could be picking up planets like this soon. NASA’s James Webb Space Telescope is launching next year, and it will be searching for specific gases in the atmospheres of planets. If it does find this combo, even more powerful telescopes in the future could follow up and see if there are more incompatible gases or liquid water oceans on these worlds. “What’s exciting about this is we’ll be able to try and make these observations very soon,” Krissansen-Totton.